I was super excited to finally start A Week of Mondays, as it is the first book I've ever read by Jessica Brody! I've had her Unremembered series on my TBR for way too long, and I was really excited to finally read something by her. I love a good contemporary novel, and I really, really enjoyed A Week of Mondays more than I expected to! I really, really liked the main character in the story, Ellie. After a really horrible day, she asks for a do-over, because she just knows if she had another chance, she could do everything differently. And that's exactly what she got, a chance to make things right, and chance to find her real self along the way. I really enjoyed going on the journey with Ellie to find herself. So much that she went through in this book reminded me of my time at high school, both the good and the bad, and it was interesting to see it through someone else's eyes. The storyline for this book was a lot of fun, even though it did have some emotional moments, and it made for a perfect summer read! I adore contemporary novels, so it only took just a few pages for me to become completely engrossed in the story. The more I read, the more I loved the book, and at 464 pages, I did not expect to finish this book as quickly as I did. One of the things I loved most about the storyline was how much it reminded me of the movie Groundhog Day, which just happens to be one of my favorite movies. That alone had me in love with the story before I even started it! 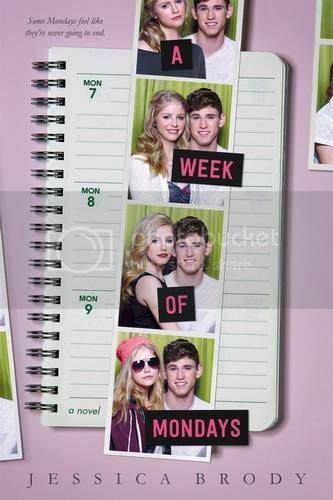 Overall; A Week of Mondays is the first book I've read by Jessica Brody, but it definitely won't be the last! I enjoyed this book SO much more than I expected to, and I'm really, really looking forward to reading more of her books as soon as possible, starting with her Unremembered series!